Kids and adults alike will love this delicious and satisfying vegetarian dish. This time of year I tend to gravitate towards cooking lighter dishes, often vegetarian, to take a little break from all of the holiday eating. My Sweet Potato and Kale Quesadillas are light yet satisfying and they’re positively packed with important nutrients. Plus, it’s also an economical dish as sweet potatoes are usually on sale at the market this time of year (and canned beans are always inexpensive). In fact, this dish is a great way to use up any leftover sweet potatoes you may have from the holidays. Now that my daughter Sienna is getting a little older, she’s become an active participant in the kitchen with me, which makes my heart swell with pride! So I’m always trying to come up with family-friendly dishes that she’ll love and will also provide her with the proper nutrition. Quesadillas are a great dish to make with your children. Most kids love cheese and it’s a good way to incorporate nutritious veggies into their diet. You can let your little helper layer on the ingredients and sprinkle the cheese on top. Then you simply toast their creation in a skillet for a couple of minutes until it’s golden, crispy and oozing with melted cheese- yum! It doesn’t get much easier than that! (lacinato) kale as it has a milder flavor, which may make things easier when you’re introducing it to your kids. I also like to add black beans to the filling for extra texture and flavor as well as a boost of protein and fiber. this dish, I like to use Cabot cheese. I used Cabot Alpine Cheddar this time but Monterey Jack would work equally well or Pepper Jack for an extra kick. If you’re watching your calorie and fat intake, Cabot also makes an excellent Light Sharp Cheddar cheese that melts really well. The cheese adds calcium, protein, and plenty of ooey, gooey deliciousness. You can serve these quesadillas with Greek yogurt or sour cream and/or your favorite salsa. I served mine with a sauce made by blending Greek yogurt with fresh cilantro and lime juice. Your kids will have fun dipping the quesadilla wedges in the yummy sauce. This recipe is featured in my upcoming cookbook, Natural Baby Food: Over 125 Recipes for a Healthy Baby. Pierce the potatoes in several places with a fork and place them on a lined baking sheet. Roast them in the oven at 400°F until tender, 45-55 minutes. Alternatively, place them on a microwave safe plate and cook in the microwave for 7-8 minutes until soft (turn them over halfway through). Let the potatoes cool then scoop out the flesh and place it in a bowl. Add the chili powder, cumin and 1/8 teaspoon salt and stir to combine. Heat 1 teaspoon oil in a large cast iron or nonstick skillet over medium high heat. Add the garlic and cook 30 seconds until fragrant (don’t let it burn). Add the kale and 1/8 teaspoon salt and cook, stirring often, 4-5 minutes until wilted. Remove kale from the skillet and place in a bowl. Wipe the skillet clean. To assemble the quesadillas, place a tortilla on a flat surface and spread ¼ of the sweet potato mixture on one half of the tortilla. Spread ¼ of the kale on top of the sweet potato mixture and top with 2 tablespoons black beans and ¼ cup cheese. Fold the tortilla in half. Repeat with the remaining ingredients to make 4 quesadillas. Heat 1 teaspoon oil in the skillet over medium heat and add two quesadillas. Cook a 2-3 minutes until golden brown, then carefully flip the quesadillas and cook until golden brown on the second side. Remove from pan. Pour the remaining teaspoon oil in the skillet and cook the remaining two quesadillas. Cut each quesadilla into 4 wedges and serve. Serve these quesadillas with Greek yogurt or sour cream and/or your favorite salsa. Sonali these are gorgeous! And i have to say, once again, great minds think alike! 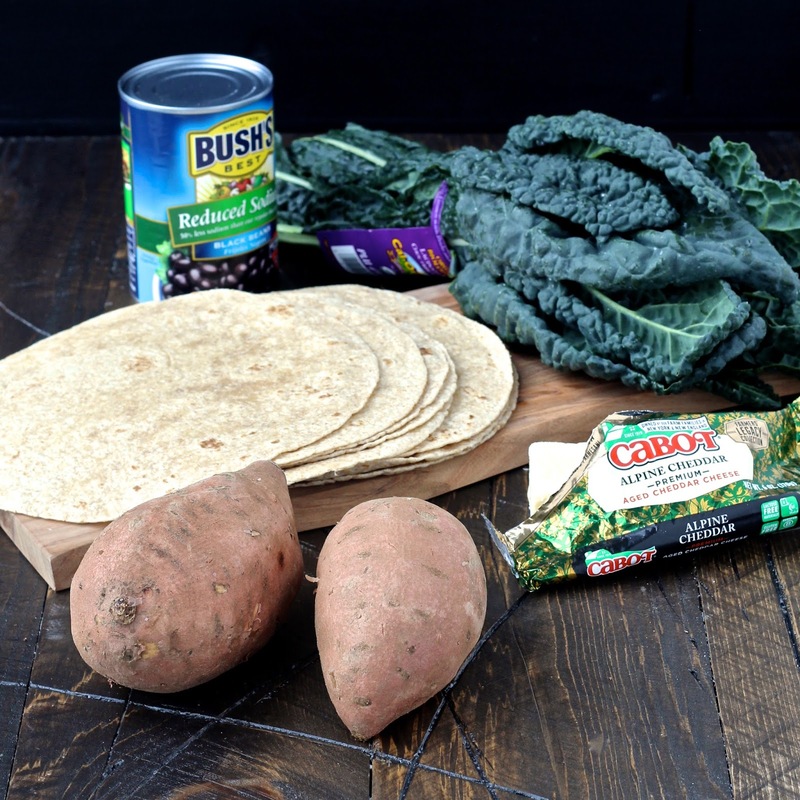 One of my kids' favorite recipes are my sweet potato black bean quesadillas. I add spinach, not kale, and it's always a winner! Ahh, those quesadillas look so good! I can't wait til I have a kitchen I can cook in again! Thanks Farrah! I can't wait for you to get your kitchen back too! Black beans, kale, cumin, sweet potatoes…why Sonali – these have some of my favorite ingredients and are pretty darn perfect! This looks amazing! I showed it to my kids and they are excited to make this for dinner one night! Yay! I hope you all love them! I love that you put sweet potatoes in these! I've never tried quesadillas with them but can just taste the wonderful flavor. Thanks Alisa! The sweet potatoes really worked great in them, I hope you try them out! Definitely adding these to our recipe list for the week. 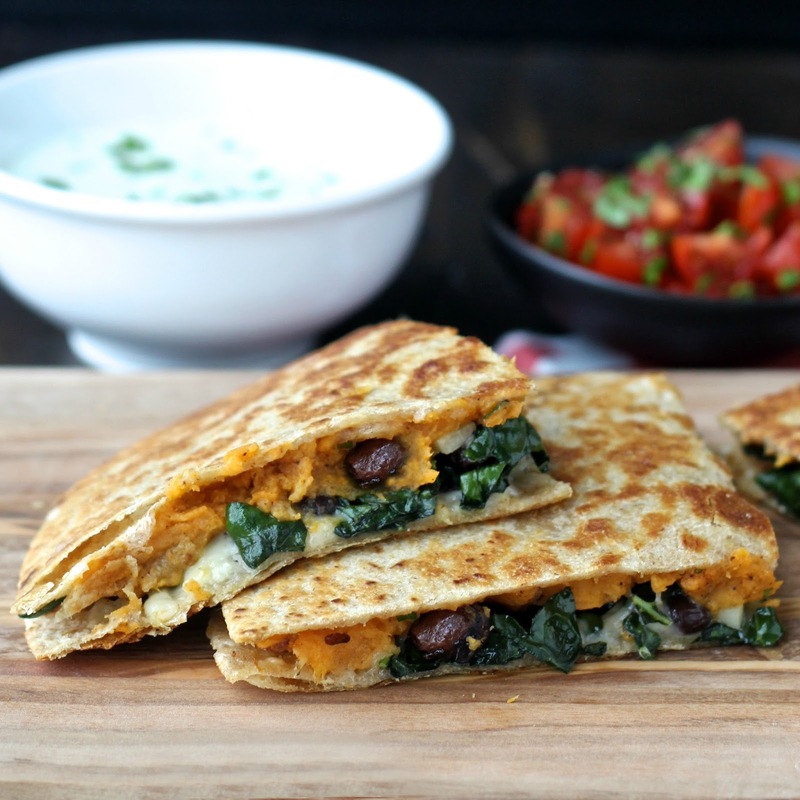 I love sweet potatoes so this is a great twist on Quesadillas! That's great! I hope you like them. Thanks!